We aren’t joking around with our tomatoes. Last year was a bit disappointing with all that rain, so we have to make up for it this year. We are doing container tomatoes, with some diy ollas (which fingers crossed hopefully work), and tucking them under a sheet at bedtime until it gets warmer. They seem like they have already grown a foot. 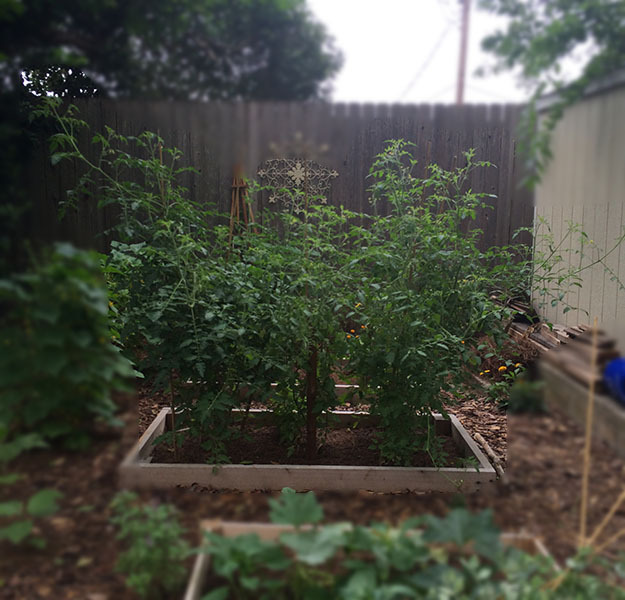 This entry was posted in Life and tagged backyard garden, container tomatoes, garden, patio tomatoes, tomato on February 22, 2016 by Chelsea. We are so happy to have some baby tomatoes starting! I love going out to the garden and seeing how green everyone is, and how fast everyone is growing. I started making my own fertilizer mix, and I really think its working. Its a more organic blend, and you know how those hipster farmers market foods can be. Next I want to start a mason bee colony, to help out until some of our flowers start blooming more. 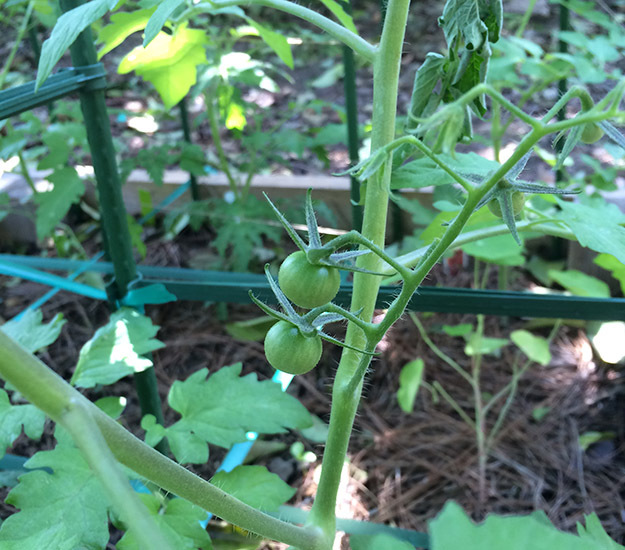 This entry was posted in Life and tagged backyard garden, garden, gardening, organic gardening, tomato on April 23, 2015 by Chelsea. Today’s harvest. 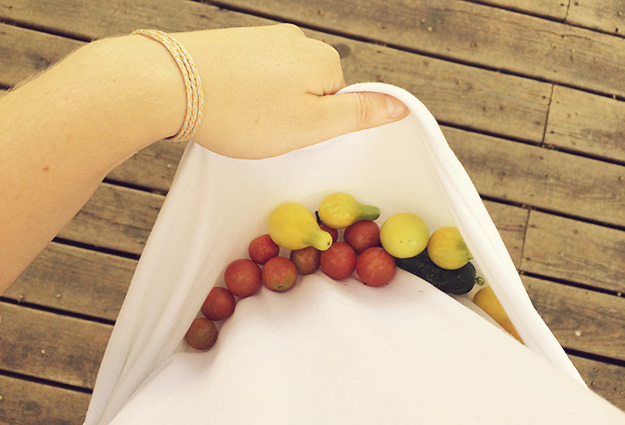 Does anyone else use their shirt as a veggie basket? 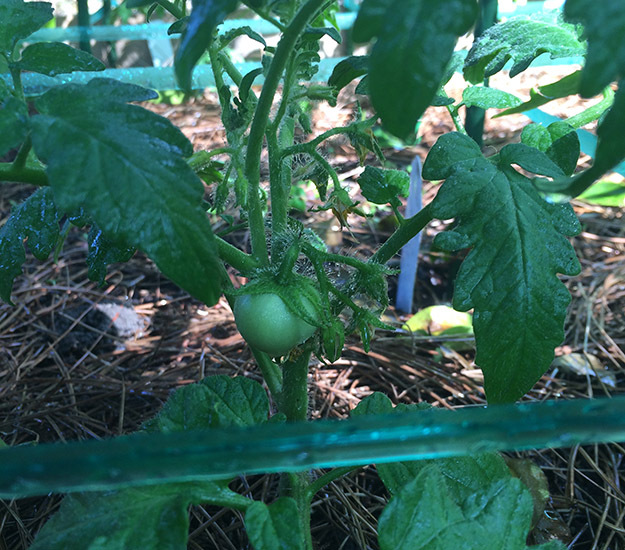 This entry was posted in Life and tagged garden, pear tomato, the simpler things club, tomato on July 16, 2014 by Chelsea. These tomato plants. Who knew they would grow so much? 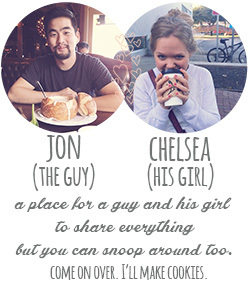 Not us. The cherry tomatoes we got were labeled as “good for porch gardens”, so you would plant them in a pot, which made us believe they wouldn’t grow taller than a person. We thought to ourselves- the small tomato cages will probably be fine. Maybe it was our fault for tenderly caring for them too much. They have consumed the small tomato cages and laughed in our faces. They have become this massive wall of tomato plant, daring to slap you in the face with a rouge branch as you walk by. We have used some stakes and string to try to hold them in, but they are just spilling out every which way. It has been kinda rainstormy lately (which is good because we need rain! 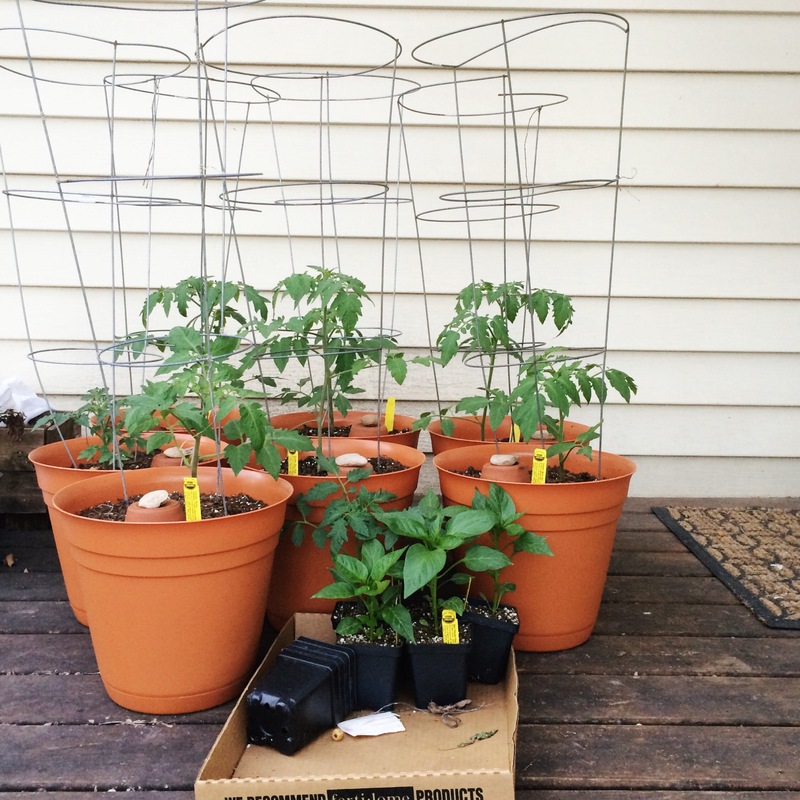 ), but it makes me worry about the gangly tomato plants. So after much stress, I found these tomato cages. Thankfully, you can build the cage around the plant. I don’t want to jinx it, because nature continues to prove to me who is boss, but look how nice and organized they are now. They have a hard time just telling me what they want, but I feel like they feel like they are better supported. Still not sure what to do about the overachievers popping out the top, but fingers crossed we are paid back with a million tomatoes! 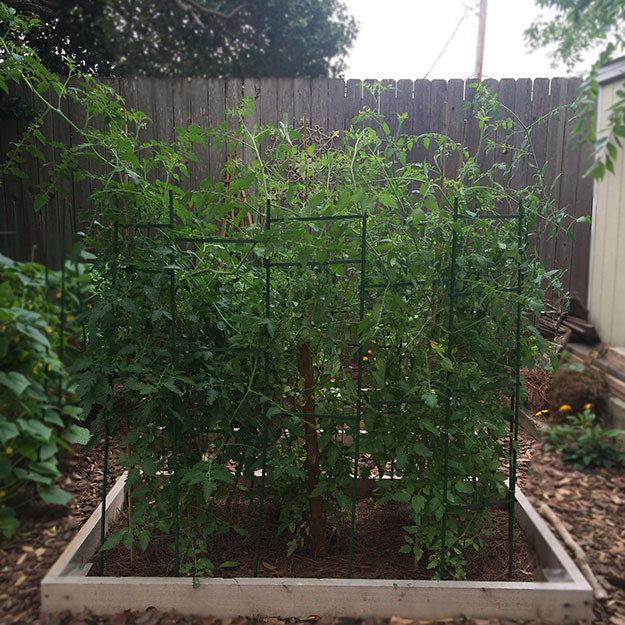 This entry was posted in Life and tagged garden, tomato, tomato cages on June 30, 2014 by Chelsea. Maybe it was the recent long weekend or the longer days, but I feel like time is moving slower lately. 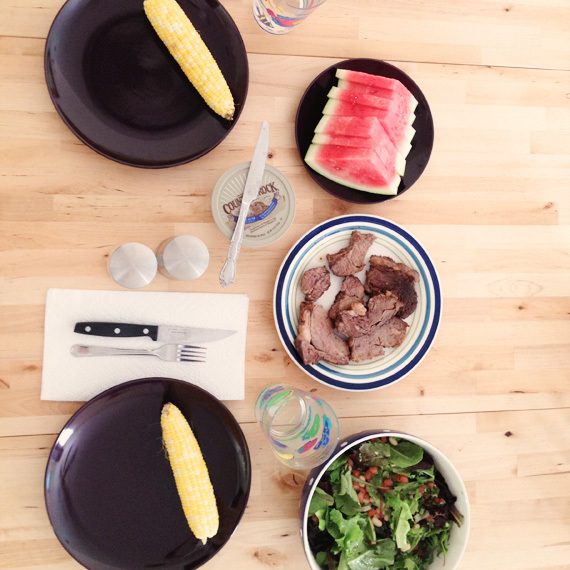 We have been enjoying the time by putting more effort into our meals. I even made salad dressing. Salad dressing. Not a baked good. This salad dressing was basically like salad salsa. 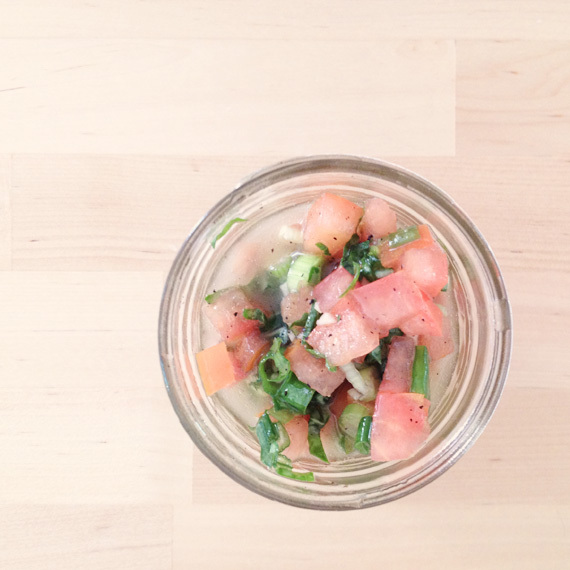 It was chopped up tomatoes, basil, and green onion. A little garlic, salt, pepper, red wine vinegar, and oil. 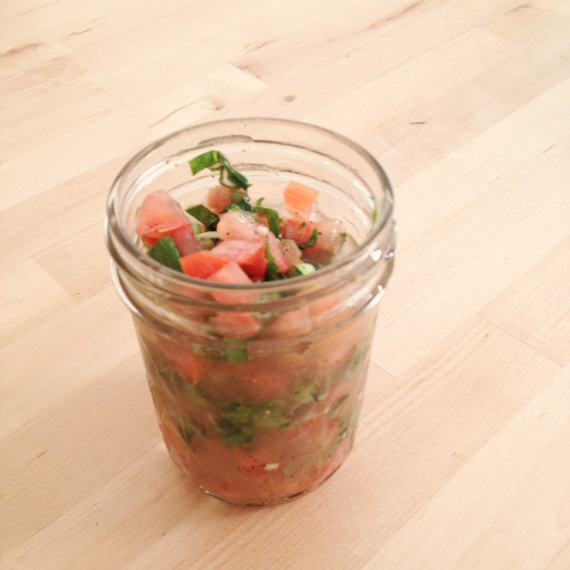 Shake it all up in a jar. 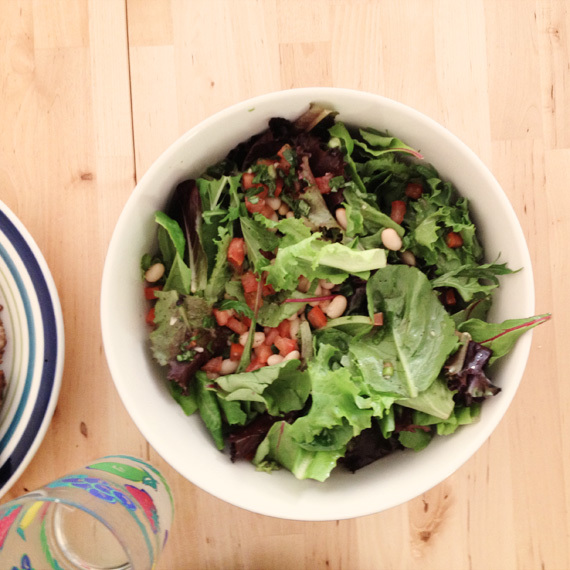 We put it on a salad of spring mix, white beans, and red pepper. 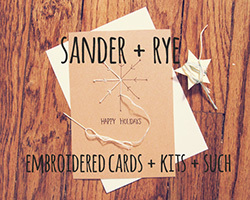 Fancy, right?? 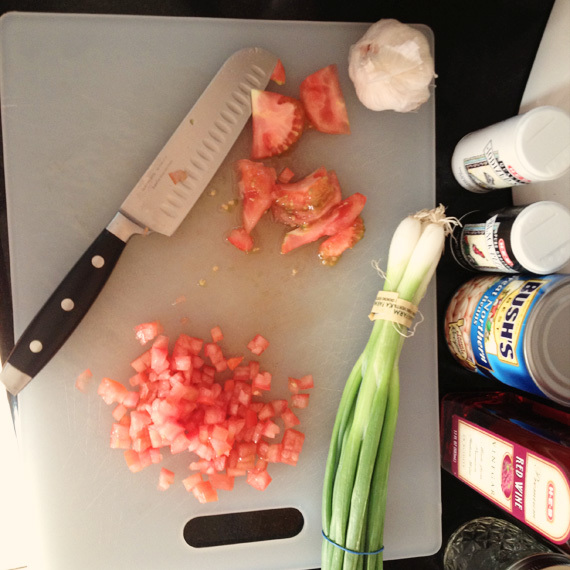 This entry was posted in Eat and tagged cooking, Food, recipe, salad, salad dressing, tomato on July 11, 2013 by Chelsea.